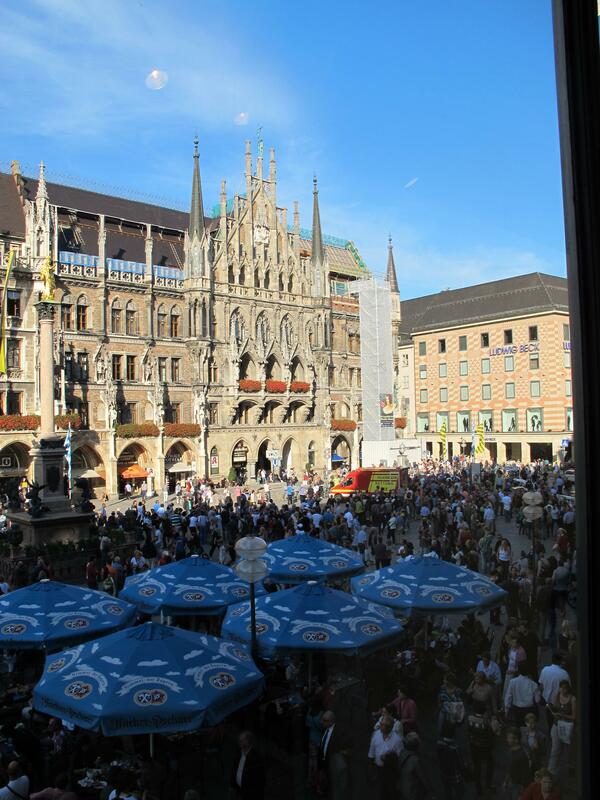 I must admit Munich, Germany is my favorite city. It probably should be Paris or Buduapest or Prague but it isn’t. There is something intoxicating about this Bavarian enclave – it’s the people, the air, the street life that I find makes me feel good. 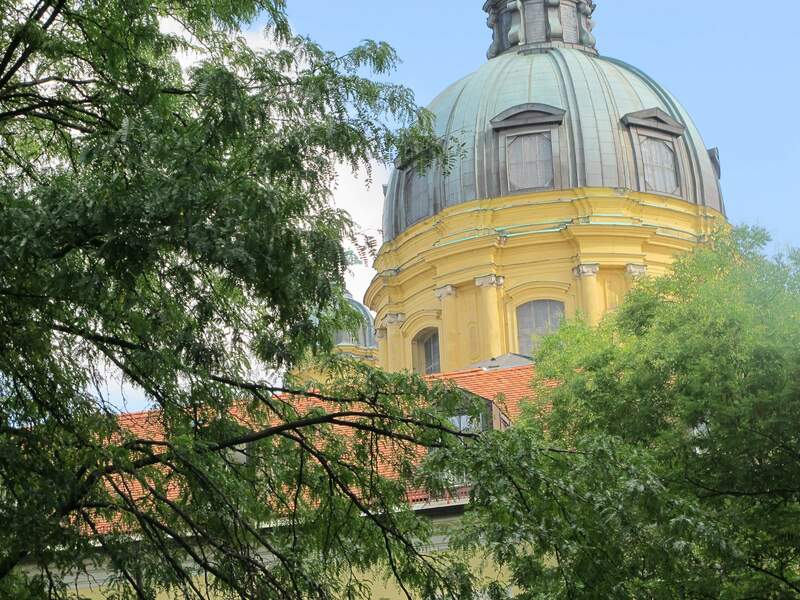 The city center is beautiful with its shops, restaurants, museums, parks, churches, open markets and beer gardens. 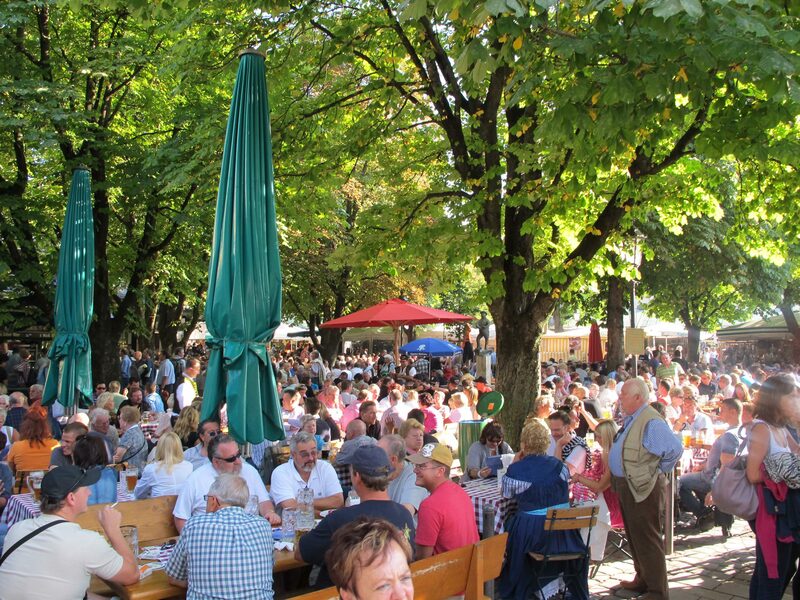 I took a walk through town the day before the first day of Octoberfest and it was busy as ever. 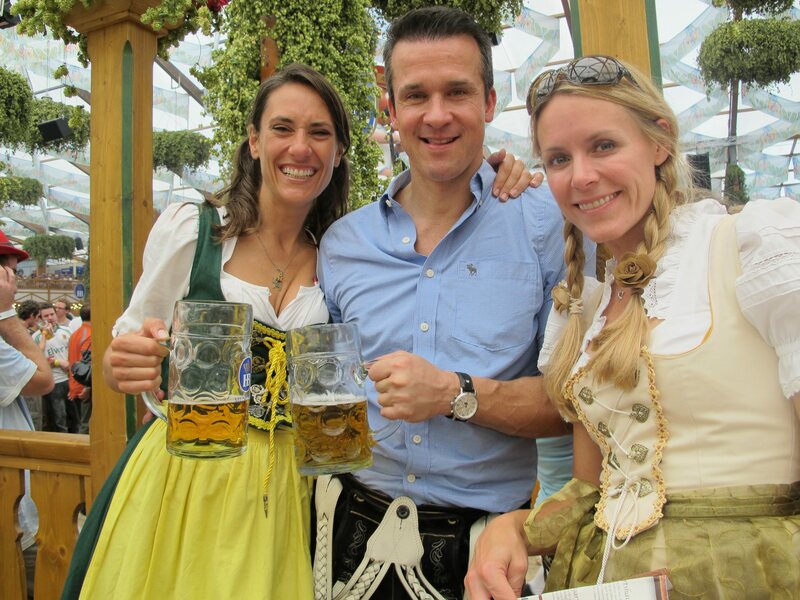 Locals and visitors are wearing their “tracht” which is a term called for the traditional dress of lederhosen and dirndls. 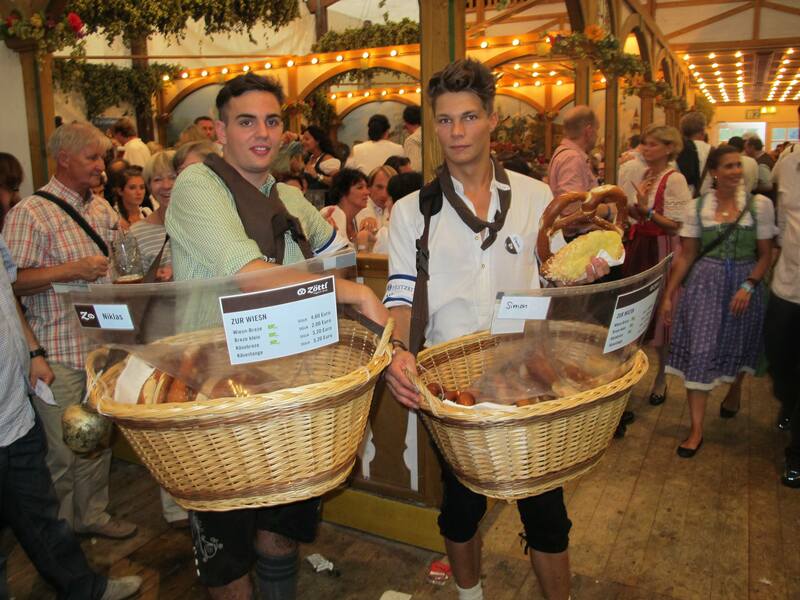 For the next 16 days people will be rocking out their best tracht: they will wear it to work, to bars, to restaurants and of course to the festival. It is not unusual to see people walking around in their tracht on even if they are not attending the festival that day. Walking in the Marionplatz I heard at least 15 different languages. There are groups of people that come from around the world to experience this massive party. 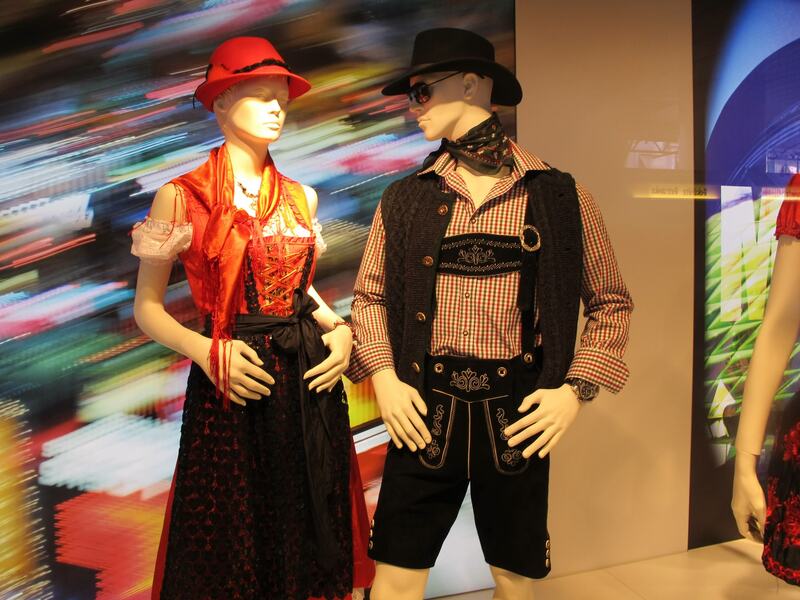 Lines of festival attendees spill out of stores that sell dirndls and lederhosen. You can outfit yourself for as little as $100 and beyond $1000 as well. Bavarians are the “Texans” of Germany. They see themselves separately than the rest of the country and they are serious about their beer and their lederhosen. Similar to texans wearing cowboy boots and hats the bavarians don’t see the tracht as a costume, it is a normal part of their lives and dress. 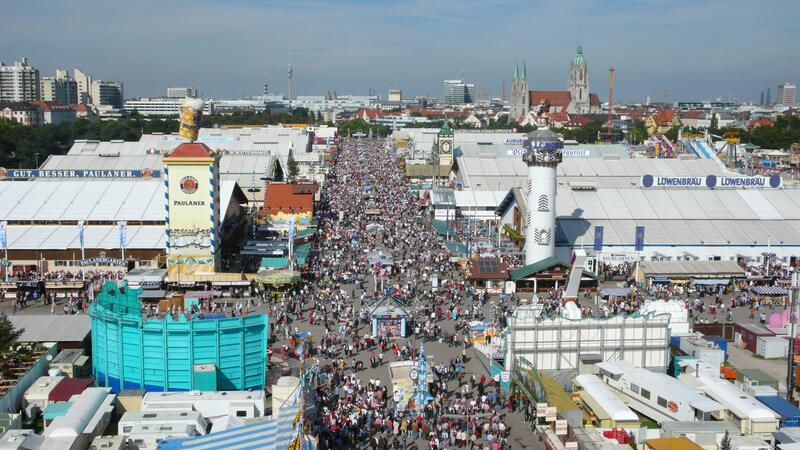 For the next 16 days, 5 million people will have the O’fest experience that is often referred to as “Wiesn” which means “The Field”. For 10 months out of the year the grounds where the festival is celebrated is just that – an empty field. Every year the tents and buildings and fairgrounds are built literally from the ground up just for this festival. When it is all over, everything thing is dismantled until the next year. It is really something else. Each tent has its own security team that tames drunken festival attendants when necessary. They look like marines and if there is some misbehaving happening, it is usually cleaned up in minutes. The tents can handle thousands of people where that drink the local beer and eat the local fare. 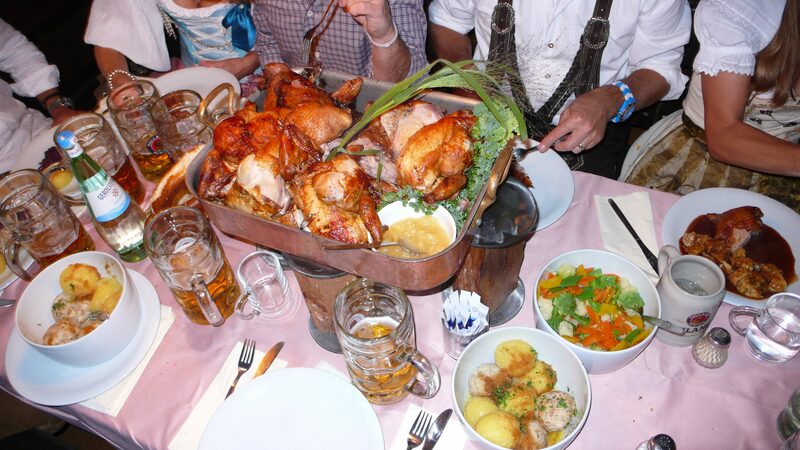 The food you find here is typical of southern german cuisine. The table reservations are staggered and each reservation has about 5 hours to celebrate, then a clean up crew turns around a section in about 20 minutes. The first reservations are at 11 am and the fair is open until midnight. The servers here that work Weisn and can make a ton of money – up to $30K in one season! But the work is grueling and the days are long. The mugs of beer they carry are extremely heavy but the more they carry the more they sell. Many of the waitresses wear wrist guards and orthopedic shoes to support the heavy load. 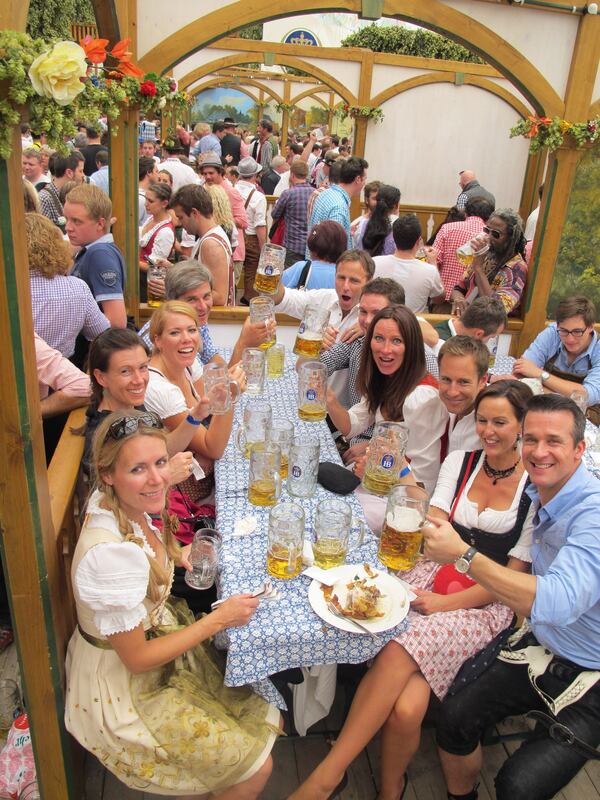 They have to deal with the demanding, thirsty, hungry drunks and do it with a combination of warmth and toughness and they do it in their dirndls. It is really an art form. Some of them have whistles and blow them while carrying the beer or trays of food to move people out of the way, some of them just yell. Our waitress was Juanita from Serbia, she handled about 75 people in her section. 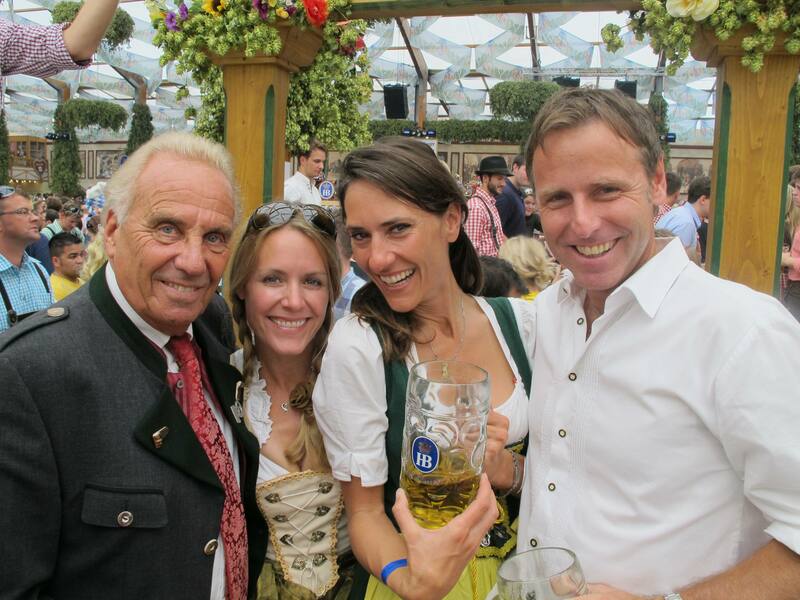 We arrived at the Hofbräu Tent on opening day of the festival. It’s 11 am and there is no beer… yet… we are waiting for the master of ceremonies to tap the keg which happens before we know it. The tent starts to shake as the beer is brought in. People are screaming as if Elvis has just entered the building… There are 1000’s and 1000’s of people here it is totally insane. The hum of noise that surrounds is enough to make you deaf. The first liter of beer is drunk, the music starts and the rest is history! With the Man Himself. The owner of the Hofbrau Brewery! There is no real way to describe what happens next… but it is a marathon of drinking beer after beer, singing to oldies like “sweet caroline” and “if you’ll be my girl” and people standing on benches literally getting drunk. It is that simple. A day off from the world if you will – a total escape. If you question for a moment the goodness in people, come to a tent and just watch the people in it. The Festival is surprisingly safe and if you look at the numbers, there is much more good happening here than bad. Sure – late in the night there are some ugly scenes, but just a few… Only the Germans could pull a festival off like this one. It is a well oiled machine and it keeps going and going and going… No one parties like the Germans…. I have said it before and I will say it again. The Germans are Ze’ Best to party with! In addition a German is the best friend you can ever have. Daniel and Patricia are included in the picture above, Daniel has been a friend for 18 years his wife for 6… they are family to me and I am always grateful for their friendship and hospitality! They have invited me to Octoberfest they are the reason I am here. Below is a friend Hendrick who I met last year at the Octoberfest. He and I ended up dancing on the tables which is forbidden by the way and a picture was snapped! It ended up making 3 of the largest newspapers in southern Germany. Quite an honor! Hendrick and I met for Round 2 this year! We had a blast! Just once, in your life – visit this party. It is so worth it. I want to thank the following friends of mine in Munich who always make my visits here special and to new friends I have just met… I can’t wait to come back and see them again. Daniel, Patricia, Jens, Marlen, Jan, Klaus, Steffi, Sabine, Thomas, Sasha, Helena, Veit, Hendrick, Nicole and Swen! Herzliche Danke für alles, bis bald! Dancing on the tables at Hofbräu tent with Hendrik!